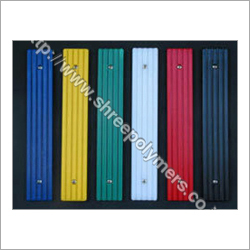 Shree Polymers is dedicated to include new techniques of manufacturing quality Polymer Amusement Parks Rides Components, without any compromise on the existing quality and production standards. Toe the line, we are manufacturing innovative Polymer Amusement Parks Parts that are assured of finest quality and enhanced safety. We use Ultra high molecular weight polyethylene (UHMWPE, UHMW) as the material of construction, which bestows the product with features of high wear resistance, corrosion resistance, and good self-lubrication. The range of Polymer Amusement Parks Rides Components include bogey wheels, bowling pin parts, drive sprockets for snowmobiles, hockey rink dasher panels, ski facings, slide bars, small skating rink floors. The non-marking and nonabrasive polymer rides components are used for lining the slide-ways present in the chute that allows smooth and simple slide. Applications of polymer amusement parks components also includes as the Guide Wheels in baby trains, carousel, dragon coaster, dragon trains, family slides, multi-lane slides, surf car rides, water splash trains and many others.